Introducing is a twelve page board book written for children ages 0—4 years old. This book has fun manipulatives for young children. When I wrote Introducing I was thinking about families with new babies and older siblings. Sometimes older children feel upstaged and forgotten after mom has a new baby. This book points out qualities that new babies and older siblings share. In Introducing the older sibling can draw on the creative page and smiles at him/her-self on the smiley page, the older sibling can also appreciate that the new baby smiles. And that the new brother or sister is loud, wet, soft and smelly, but so is the older child. The new baby is not that different from the older child and all children are precious to God. 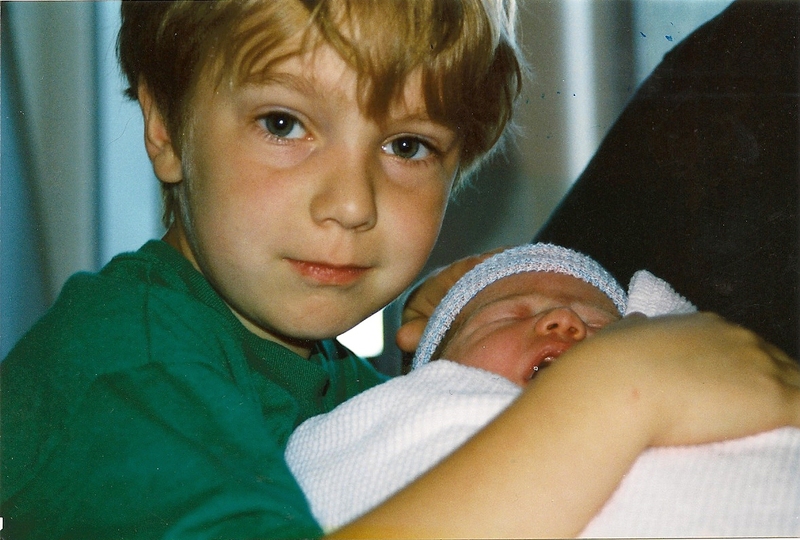 Joe’s expression in this photo speaks to me of his protective nature toward his little sister. He looks sweet but also like a little boy who is ready to go outside to run and climb trees. I took the photo on the day Katie was born.